FORT ST. JOHN: BC Hydro is donating $70,000 to support seven Peace Region non-profit organizations through its Generate Opportunities (GO) Fund. Award recipients are providing community services and programs in support of literacy, community outreach and accessibility, seniors' health, and arts and culture. One of the seven recipients, Fort St. John-based Northern Environmental Action Team (NEAT), received $10,000 for its NOURISH program. NOURISH works to freeze, dry or can grocery store foods that would otherwise be discarded, and then donates them to local food banks. L-R: Phallon Stoutenberg (Women's Resource Society), Karen Mason-Bennett (Northern Environmental Action Team), Cassia Lawrence (North Peace Savings and Credit Union) and Cameron Eggie (Salvation Army) display rows of produce preserved during NEAT's 2017 Community Can event. 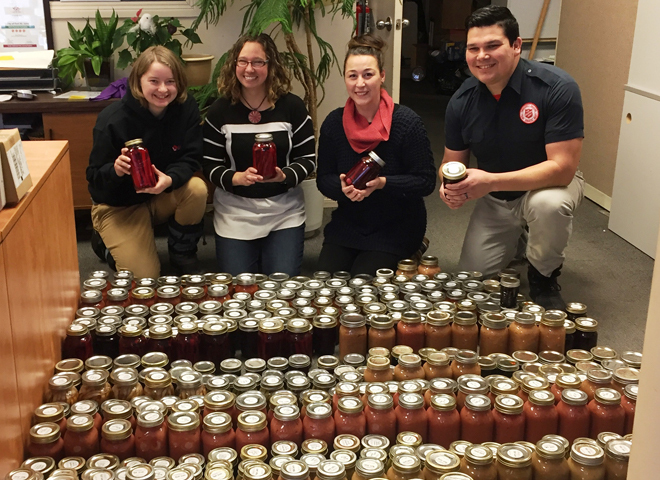 The Community Can has donated more than 1,500 jars of locally preserved produce to the food bank since 2014. "NEAT is really grateful to be working with our community partners to increase food security and reduce food waste in our region," said Karen Mason-Bennett, NEAT's executive director. "This funding will help support the development of food and job skills and ensure that the most food possible reaches those who need it."